Discussion in 'Transformers News and Rumors' started by C2567, Aug 18, 2010. 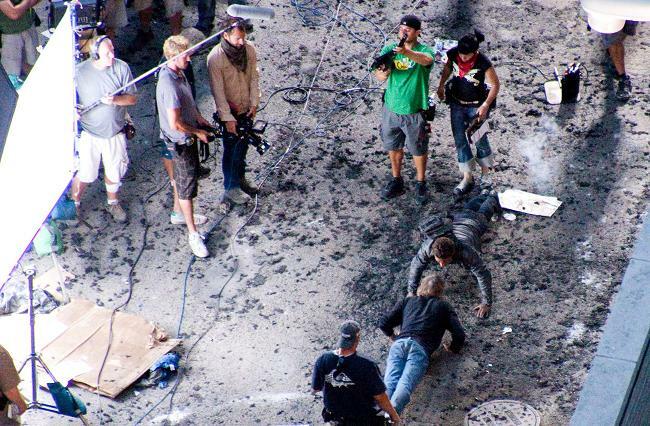 One of the photos show Michael Bay Seated close to Sam, Reading out the instructions perhaps? News staff! if you didnt know already.. It's probably just one of those wrist-mounted Guitar Hero controllers. Either that or the latest BayVerse mcguffin which, surprise surprise, only Sam can use. Even though it's probably of ancient Cybertronian origin. YouTube - I love the power glove. It's so bad. I already see Hasbro making the toy of the glove. Okay, the 'powerglove' is unexpected... but why is one of the crew members wheeling Michael Bay around like a wheelbarrow? RotF Spacebridge hand injury --> Seeker-infused Super Saiyan Sam? Further, perhaps an excuse for him to earn the "Spike" nickname? Sam gains the mystical Punch Of Kill Everything. Plus ten experience points. Hmmm.... you know, i saw a rumour a while back that Sam gets a pair of 6 inch 'pet' autobots.... I wonder if, as Bay likes them, they combine to make the glove? Now he's playing with power! Indeed the only question is adult sizes or child only. Oh God this movie is going to be soooooooooooooooooooooooooooooooooooooooo bad. "Yeah, We won't have the robots change size because that's STUPID"